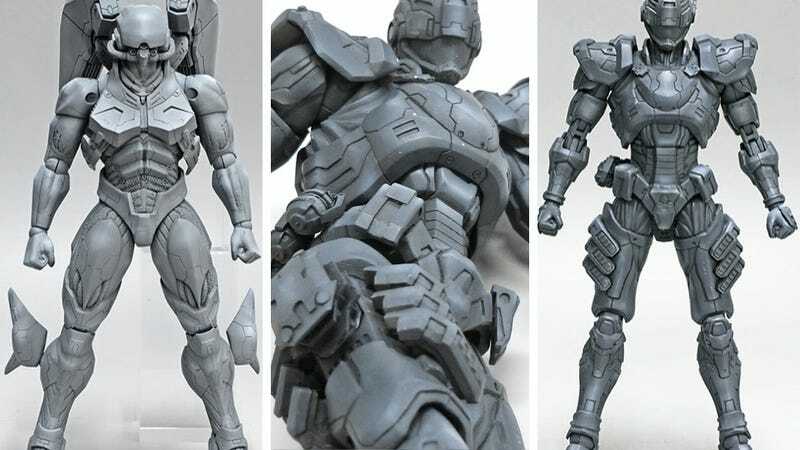 Fast-pace shooter Vanquish is being immortalized in resin with two upcoming figures. The game's developer, Platinum Games, is showing off the figures. Have a look. They're unpainted prototypes, and according to Platinum, there are still minor tweaks being made. Square Enix Play Arts Kai line is creating the figures, which were last shown off last year at Comic-Con. There's lead character Sam. According to Platinum Games designer Kenji Irie, "They have captured every little detail in the ARS Suit. They even brought to life many of the little details on the inner suit as well." The second figure is Zaitsev in Bogey mode. "This one still needs that final level of fine detail, but the proportions are very close to what is actually represented in the game, and when you pick it up you get this awesome feeling of heft to the toy," said Irie. "It's great."